WIRR showcases the best research papers from Master of Arts and Global Master of Arts students in international relations. Chosen through a competitive blind review process, these working papers reflect the breadth of the international relations discipline and its key subfields. Papers are selected for their innovative content, analytical rigor, and contribution to the scholarly literature. This high-quality learning experience reflects Webster’s commitment to global education and the robust exchange of ideas across its worldwide campus network. 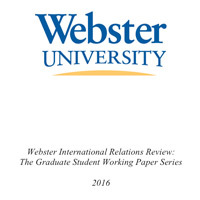 The working papers can be accessed at no charge at http://library.webster.edu/wirr/.